Colleges are constantly expanding. But not everyone is happy with the results. With some U.S. universities now millions of dollars in debt, students often absorb the costs of campus construction—in the form of increased tuition. How can shipping container buildings help? With shipping containers, building materials cost less, construction times are cut in half, building site preparation is less extensive (or not even required), and colleges can decide to relocate/reuse buildings as their needs evolve. 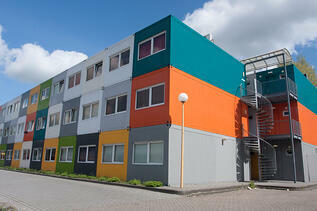 Not long ago, container housing was a trend confined to youth hostels and pop-up hotels in Europe. But like other diminutive imports—Smart cars and Babybel cheese—smaller student digs are gaining stateside popularity. And when you do the math, shipping container buildings for student housing make a lot of financial sense. It happened recently in Washington DC, near the campus of Catholic University of America, where private student housing owners realized they couldn’t afford to rebuild their apartments using traditional materials. The landlords opted for a cheaper, more maneuverable rebuild using containers, which are also known as “high cubes” or “sea cubes.” The new shipping container building features four apartment units—each on its own floor; each consisting of six bedrooms and six bathrooms. The project was completed in just a few short months. As more and more academic majors emerge, departments are outgrowing their classrooms and lecture halls. According to the Department of Education, colleges and universities reported nearly 1,500 academic programs in 2010. Nearly 24 percent of those majors were only just added after 2000. Majors that don’t draw huge numbers, but do require labs and workshops, may be spread across campus—in pockets of free space that lack comfort or convenience. Now colleges can use shipping containers as portable laboratories—especially for niche majors like cyber forensics or agroecology. Some medical schools are already building mobile wet labs for students. Today, more than 50 percent of college faculty members are “contingent,” or adjunct instructors. These academics don’t just miss out on tenure-track benefits; they also forego research space and defined areas for office hours. Portable office units are a great solution. Shipping container buildings could work equally well as temporary office space/teaching space for a guest lecturer or visiting professor. Colleges have invested huge sums on recreational facilities and luxury dining halls—the kinds of structures that appeal to every student. And we all know how swanky the athletic areas can be at top-tier sports schools. These construction plans don’t leave room for student artists, who also need rooms to function as studio space, exhibit space, performance space, etc. See how Pomona College is housing its studio art activities. Stacked and joined shipping containers can achieve a similar effect. Sustainability studies are on the rise. Many schools now offer continuing education workshops and certificate programs in areas like Leadership in Energy and Environmental Design (LEED). Others offer individual horticulture/agriculture classes, wherein a portable greenhouse could prove essential. Penn State, for example, offers a course on Eco Roofs and Green Technologies (living walls, constructed wetlands, etc. ).